At Office Furniture GB we offer a stylish range of Low-Cost Glass Display Cases that make an attractive addition to any foyer area. 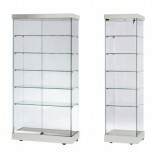 Our glass display cases are finished to the highest standard and available in a wide or narrow size. 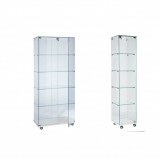 Contact Us for more information on our range of Low-Cost Glass Display Cases. 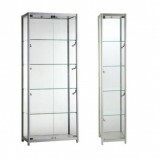 Economy Frameless Display CabinetsAn economical, entry-level range of frameless display cabinets, offering good quality at an affordable price. Economy display cabinets are flat-packed for self-assembly, and feature fixed glass shelve..
Aluminium Panorama Display CabinetsPanorama glass display cabinets are superb quality and stylish way to showcase product in the office or showroom, delivered fully assembled for immediate use and pre-fitted with LED side and downlights whi..
Tuscan Glass Display CabinetsStylish, yet economical frameless glass display cabinets with coloured trim. Supplied flat-packed for self assembly and available in 3 size versions in 3 different colour options to offer a wide range of mercha..